Fun Day at Horse & Farrier helps the Trust reach their Crowdfunder target! To help the Trust raise funds for the Trust’s Crowdfunder appeal Ashlee Myers and Hayley Beck whose brother Harry has Centronuclear Myopathy, decided to have a Fun Day at a local pub, ‘The Horse & Farrier’. Between them they organised all the stalls and events, the raffles prizes, the tombola and the fun! They even went round other pubs in the area selling raffle tickets for prizes. Due to the Myotubular Trust Crowdfunder deadline, plus the availability at the pub, the only date available to run the Fun Day was Sunday 6th July – which just happened to coincide with The Tour de France grand depart, the Wimbledon mens final and the British Grand Prix!! So no competition then! 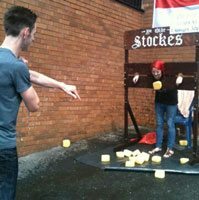 Despite all the other TV events, plenty of people turned out and a fun day was indeed had by all, even the people who volunteered to go in the stocks and get pelted clomiphene online with cold water sponges!! 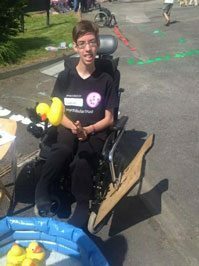 Harry even designed and ran the wheelchair obstacle course stall himself, with people negotiating sets of cones, a ramp and then reversing into a parking space, all against the clock. We would like to thank everybody who gave their time to run a stall, all those who donated the fantastic prizes plus Jessica Fleming for her beautiful cake and cupcakes and Claire Marshall for her gorgeous cupcakes. A big thanks too to all the guys from MICJ bouncy castle hire for their castle and prize donation plus Amanda from the Horse & Farrier for her help in staging the event. 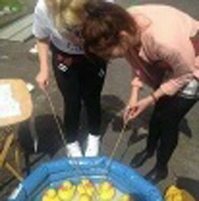 Most of all thanks to Hayley and Ashlee for all their hard work in raising over £630 for the Trust, helping us to reach the Crowdfunding target! PreviousErrol’s wild and wolf runs as ‘Woody’ are for William!